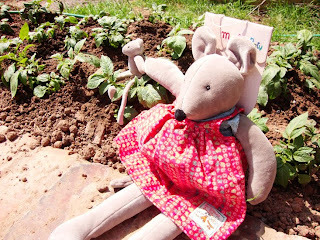 Cottontails Baby: Potato growing advice...? I have been 'earthing up' my potatoes for the last fortnight and am wondering how much longer I should keep this up? They keep on growing - which is a good thing - and I'm going to end up with a mountain if I keep heaping earth on them... Advice please! In the meantime the sunny potato patch is proving to be a popular spot with Nini mouse and her baby..
Also, I have finally got a Cottontails Baby Facebook page up and running. It's a bit more interactive for competitions and things. I can't wait to get my mouse in a box! I've never sewn a mouse before and I think it's time to try. I love Cottontails Baby! Have a happy, whimsical day, Charlotte! Know nothing about potato growing but I can come and eat them! I usually stop when the mound of earth is about 6 inches high. Partly because I'd run out of soil if I tried to go any higher! My mouse came! I love her. I have to hide her from the granddaughters. She's mine. Thank you for the lovely packaging and the sweet little soap, too. How divine! Oh, I'm so happy with my little purchase. Cottontails Baby is awesome!